There are two types of return transactions in InventoryEdge, Supplier Returns and Inventory Returns. 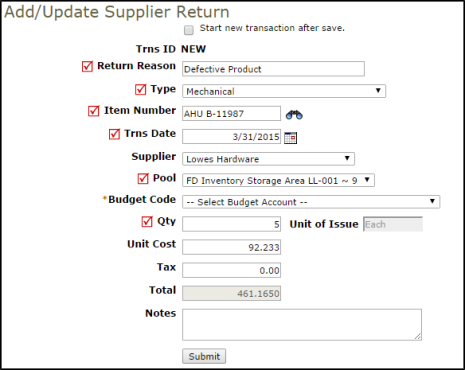 In a supplier return, you are removing the inventory items from your on-hand quantity and returning the items to the supplier you purchased them from. An inventory return is when items that were previously issued out for use are returned back to your stock, adding that amount back to your on-hand quantity. Required fields are indicated by a red check box . From the My Returns list, click on the + Add New Supplier Return link on the right side of the list. From the My Returns list, click on the New Supplier Return (Clerk Form) link in the Shortcuts section at the top of the page. Enter the information into the appropriate fields and click Save at the bottom of the form. From the My Returns list, click on the + Add New Inventory Return link on the right side of the list. 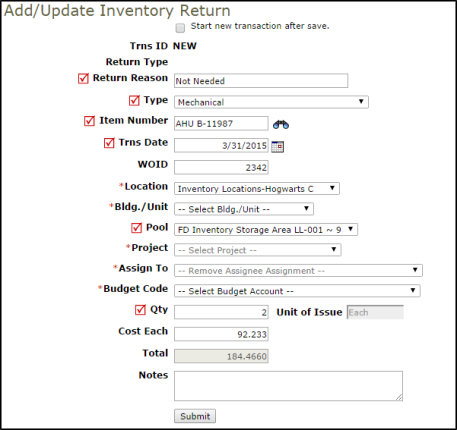 If you enter a WOID for this return, the Location, Bldg./Unit, Project, Assign To, and Budget Code will populate based on the information on that work order. If needed, you can select this information manually if the issue was not related to a work order. From the My Returns list, click on the New Inventory Return (Clerk Form) link in the Shortcuts section at the top of the page.